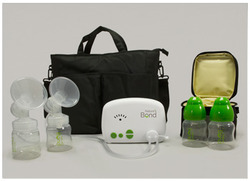 Devon Medical Nature’s Bond Electric Breast Pump Kit. Features and Benefits: BPA FreeLight Weight & Portable (less than a pound). Simple Use (Various sizes and breast shields included)AC Power Adaptor Included. Kits Includes:(1) Pure 603 Model Pump(1) AC Power Adapter, (1) Carrying Bag, (1) Cooler Bag(4) Bottles, (2) Tubes with Connection Valves, (4) Caps, (2) 80mm Breast Shields, attached to pump, (2) 76mm Breast Shields, (2) 74mm Breast Shields, (6) AA Batteries.